Why Should Organ Donors Suffer for Their Selflessness? In addition to their willingness to undergo a potentially risky invasive procedure for the benefit of someone else, living organ donors also are financially generous. Their out-of-pocket expenses average $5,000 because, although a recipient’s insurance covers the donor’s medical expenses, it doesn’t cover transportation, lodging, child care and lost wages. So there’s a movement to relieve this enormous burden that could spur an increase in organ donations. Given this country’s extreme shortage of donor organs, that would be w welcome development. According to Reuters, experts suggest that removing the financial barriers to organ donation might include “careful consideration and testing of potential financial incentives for organ donation.” That is, an ethical way to “get rid of financial ‘disincentives'” to donating one’s organs. The blood-thinning drug Pradaxa has starred in a long-running drama with hundreds of adverse event reports, scores of lawsuits and more than 500 deaths. Introduced in 2010 as an option to Coumadin (warfarin), Pradaxa is under fire for dire side effects including hemorrhage and internal bleeding, as we wrote earlier this year. Unlike older anti-clotting drugs, Pradaxa has no antidote for uncontrolled bleeding. The latest chapter in this tale was told earlier this month by the New York Times, when the FDA released a report concluding that Pradaxa did not show a higher risk of bleeding than warfarin. As The Times noted, the report did not mention the lack of an antidote. For people whose kidneys no longer function well enough to process waste products or maintain proper levels of certain chemicals in the bloodstream, kidney dialysis is the only treatment except for transplant. 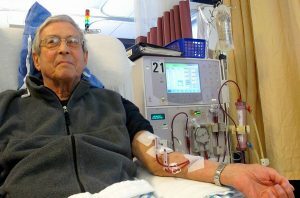 But kidneys — and the dialysis procedure — are complicated, and a few recent stories are a heads-up for people affected by kidney failure or disease. The danger is especially acute for patients older than 75. The glomerular filtration rate (GFR) quantifies the rate at which filtered fluids are processed by the kidneys. By medical consensus, a GFR of 10 is deemed “early” for dialysis. But from 1996 to 2009, the number of elderly people who started dialysis when their GFR was lower than 10 increased from 1 in 4 to more than 6 in 10. The number of bloodstream infections in intensive care units (ICUs) caused by tubes inserted into major blood vessels decreased significantly between 2001 to 2009, but unacceptably high rates of infection are still occurring for patients in other hospital units and for dialysis patients, government researchers say. Central lines are tubes that are usually placed in the large veins of the neck or chest to deliver medicines and nutrition. Infections of these lines, which are largely preventable, can become serious problems, with death rates of 12-25%. An estimated 18,000 ICU central-line infections were recorded in 2009, down from 43,000 in 2001, according to a report by the Centers for Disease Control and Prevention (CDC). This 58% decrease means that in 2009, between 3,000 and 6,000 deaths were prevented and as much as $414 million saved. And if the decrease in these ICU infections was steady from 2001 to 2009, as many as 27,000 lives and as much as $1.8 billion may have been saved.